Recently I realized that I am the Grinch of all mothers. I’m a part of a few Mommy Groups on Facebook and the other day one of the groups asked the question, “Should I make gift bags for my son’s birthday party?” Some of the responses were: “Aw, I love making gift bags.” “Glow sticks from the Dollar Store!” “What if you just did…” “….would be cute.” My response was, “OMG don’t do it! I hate those gift bags. They are a waste of money for you and no parents want all those little tinker toys scattered across their house!” Maybe I’m just a special kind of evil, or maybe I’m not alone and you totally know what I mean. Those tiny toys were invented by the devil himself to keep my house full of clutter and to ensure that I step on something painful every day. I love my kids (despite their lack of gift bags at birthday parties) and I cherish my home and work hard to keep it tidy. Because of this, I try to invest in memories and adventures instead of toys and electronics. 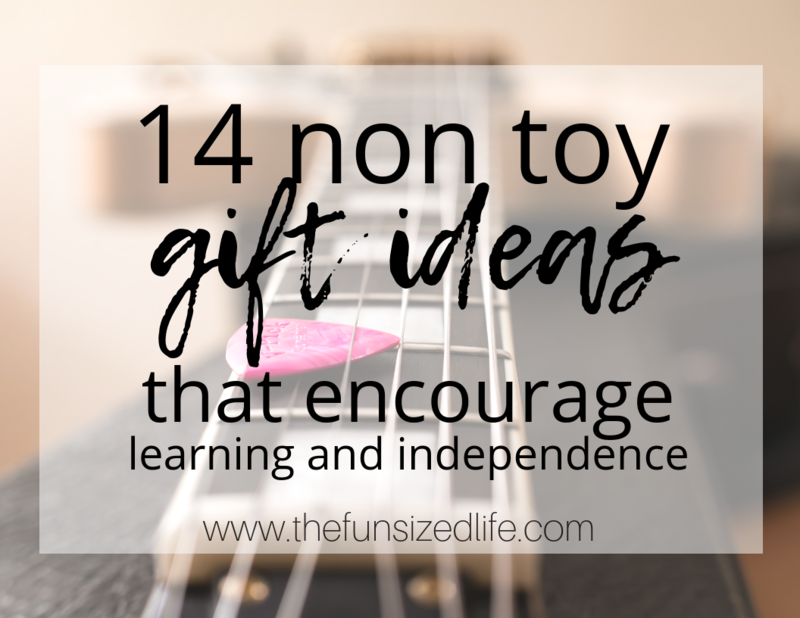 If you also want to encourage learning, creativity and independence see my must have list of non toy gifts for kids. *This post contains affiliate links. For more information, see my disclosures. If you have a local Science Museum, zoo or other learning facility, chances are they have some sort of family membership! These are a great investment for the entire family. When you are presented with dark, rainy days, there is no better way to spend time that learning together as a family. If you are a sentimental mama like me, you will love Past Book. They offer a wide variety of digital scrap books. If you have little ones, this could be a way of documenting their art work for the year. You can create a Year Book, or even a Facebook Page Photo Book. Montessori style learning is becoming more and more popular, so much so that people are starting to style their children’s rooms specifically to encourage early learners. One of the best features of these rooms are the types of beds that are often used. These beds are low to the floor to encourage independence but they are also absolutely adorable and are a perfect fit for any kid room. Letting the kids really take in the world around them is the best way for you to see through their eyes. This also allows them to great creative with the people and objects around them. It’s always fun to see what they choose to photograph or how they might be viewing the world a little bit differently. Now I know magazines can be a clutter-free home’s worst nightmare. But hear me out. Kids love getting stuff in the mail just for them, there are a ton of them that encourage learning and reading. Then, when the next mont’s subscription comes, it’s recycling for the old one. You could use the photos to create collages, teach about composting or even make some styling paper airplanes. The learning doesn’t have to end when the articles do! Save up to 90% off Popular Magazines like National Geographic Kids and National Geographic Little Kids, Time Magazine and more! I’m not saying you have to opt for the drum set, don’t worry. But, the best way to encourage a love for music and to help children continue on with music in the future is to allow them to experiment now. I am the crazy mom who did buy her son a drum set for Christmas and I plan on getting the girls ukulele (spell check, please.) Amazon, of course has a ton of totally reasonably priced new and used instruments. Here are some of the best finds. If I didn’t have you hooked after Mason jar, I don’t know that we can be friends. I am one of those totally cliche people that loves everything Mason jar. They are just so simple and timeless. They remind me of all the canning my grandma used to do. Simpler times. Anyway, there is an awesome company, called Mason Jars Company. They have a ton of Mason jar fermenters for you canning and fermenting enthusiasts, and for your kids they have a glow-in-the-dark, magnifying bug catcher. If you love encouraging your kids to get outside (like I do) this is a great and inexpensive gift that they can enjoy all year! If you have older kids who already have a huge passion for baking (or even if you do) there are great classes you can take online like the ones offered through Designer-Cakes.com They offer online tutorials, Paul Bradford Sugarcraft School Ltd and even 1 on 1 private sessions! If you have a serious cake enthusiast in your family this would be such a great way to encourage their creativity right from home! comes with a very small hammer and a few smaller nails so it definitely requires supervision. No surprise both or our little ones wound up loving these gifts and have been building like crazy. Here are some great online building toys and kits for kids. This one is probably hands down the most amazing thing I have seen out there for older kids who have a passion for the entertainment industry. They offer a wide variety of classes from professionals. I’m talking Christina Aguilera teaches singing, Steve Martin teaches comedy, Gordon Ramsay teaches cooking… I could go on and on. They have writing, fashion design, movie scoring, film making, writing for TV. These are all taught to you by well known professionals for only $90. This is something you can easily gift to anyone as they have that option set up on their site. For those kids with passion, check out Master Class. Sewing kits can be a fun way to get your kids making gifts for others, plus teaching basic life skills. As always, Amazon offers a variety of starter kits for kids. Check out some below.
. It took about 4 coats to finally get it as solid as it should be but it was totally worth the effort. My kiddos and their friends love coloring all over the wall, playing tick tack toe or just creating. This is hands down my favorite one! We have friends who woke their kids up Christmas morning and said: “We’re going to Disneyland!” Talk about parents of the year. One year my husband and I planned a stay-cation. We went to The Waterpark of America. There was an awesome Groupon and for 2 days at the water park, plus hotel and food we spent about $200. It was one of our favorite family memories. Hands down. If you have been saving up and are totally game for a full on vacation, check out Tours4Fun. They offer tours and activities in the United States for places like Florida and Niagra Falls. Or if you are feeling crazy adventurous, give the 6-Day Milan to Paris Tour a try! There may be no creativity, but travel DEFINITELY encourages learning. It really doesn’t matter where you go. Plus, time together is really a priceless thing. Minimalist Christmas List: The Best Six Gifts for Kids for Lasting Joy. We do the Facebook photo-books a few times a year. So much fun to look back over my daughter’s year! Great ideas. These are such wonderful ideas! What a great post! I’m not a mom yet, but I’m totally with you! These are awesome ideas for encouraging children to learn! Definitely going to use some of these ideas for one of my cousin’s birthdays! Thanks for putting together such a thoughtful list! So glad you liked them! I’m so glad my thinking has changed over the years. We used to spend so much money on toys that went un-played with! I love the idea of a chalk wall and the idea of a membership to the local zoo! These are such fun and unique ideas! Both are so great! The chalk wall has been a huge hit with my kids and all their friends.